If you haven’t heard of the Carbon Design System before, check us out! 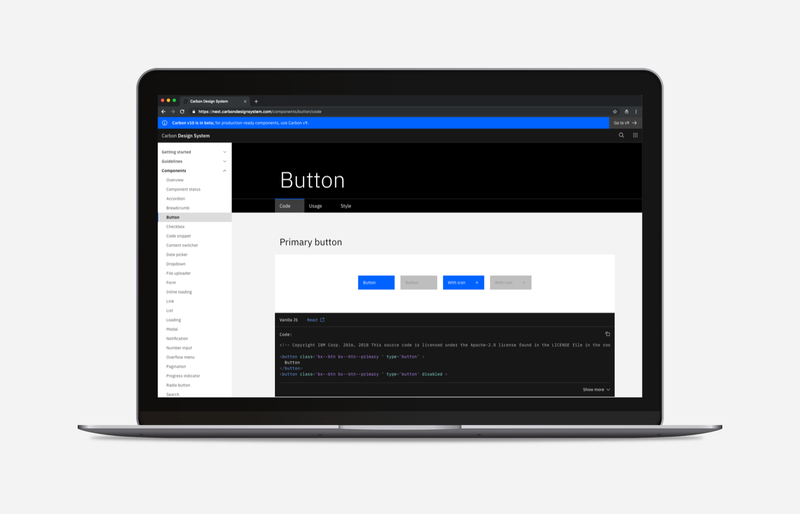 We’re the design system for IBM, shipping open-source styles and components in Vanilla, React, Angular, and Vue for anyone building on the web. When adding Carbon to a project, one of the first things you’ll tackle is how to include CSS for components you want to use. If you’ve followed along with our Getting started guide, or any of our Up & Running posts, we offer some tips for how to add Carbon quickly to your project. What about the next step though? 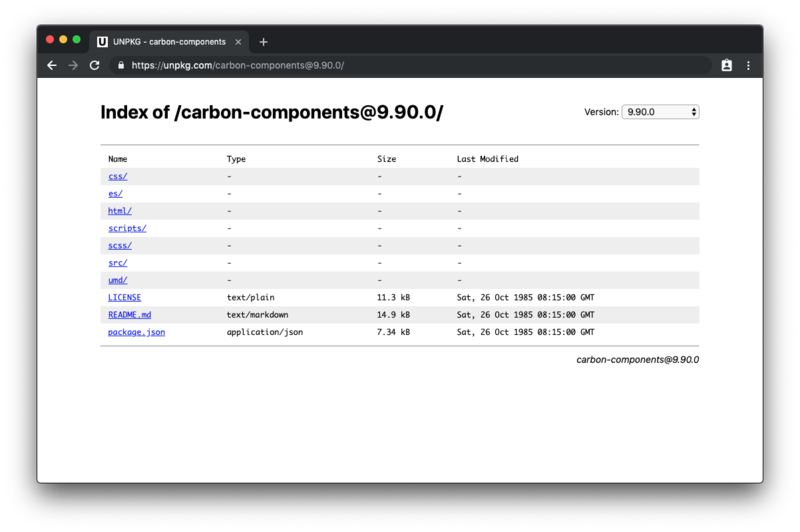 If you’re a team into optimizing every part of their UI, you might be curious how you can shrink the amount of CSS you’re shipping that comes from Carbon. Turns out, we can help. If you’ve followed along with Carbon’s getting started guide for developers, you might have seen a section where we call out using a CDN. Since we publish Carbon Components as a package on NPM, we are able to use a service called Unpkg as a quick way to serve files distributed via the carbon-components package. 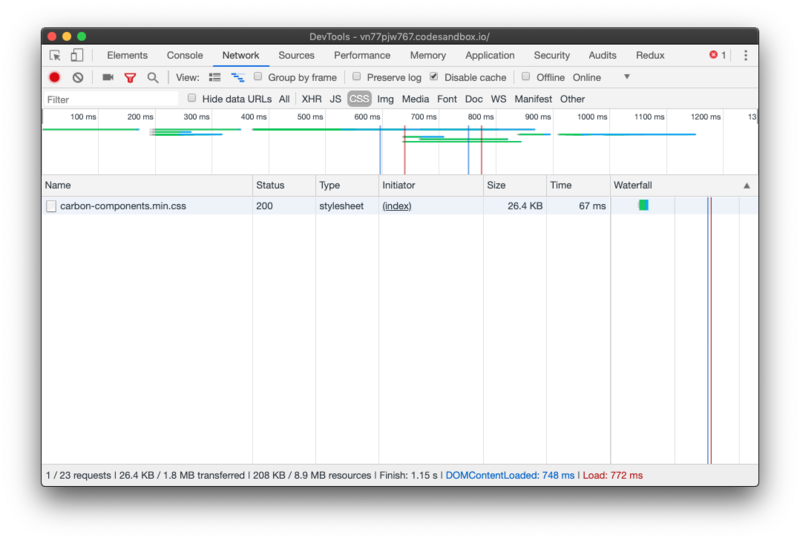 When we start to consider the performance of this approach, however, it becomes clear that this will include every single bit of CSS that Carbon outputs. Sometimes, you totally need everything that the project provides, but for a good number of teams you may find yourself using only a subset of our components. 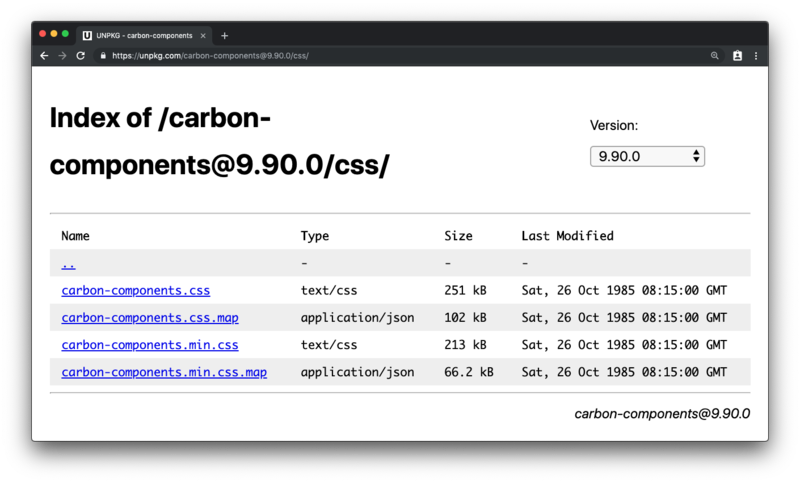 If we take a look at the directory listing for carbon-components's CSS folder, you can see that the overall size of the carbon-components.min.css file is 213kB. What we learn from this is that the uncompressed size of Carbon’s CC is around 213kB, but if we use a file compression format like gzip that number drops dramatically to 26.4kB. For some teams, this number might fall well within their performance budget. However, if you’re a team using precompiled CSS from Carbon you might be wondering how do you make use of aspects of our design system like theming. So, if using the precompiled CSS isn’t ideal, what are some other options? Note: this import path may change depending on how your project is setup, for a full guide checkout our getting started guide for styles. 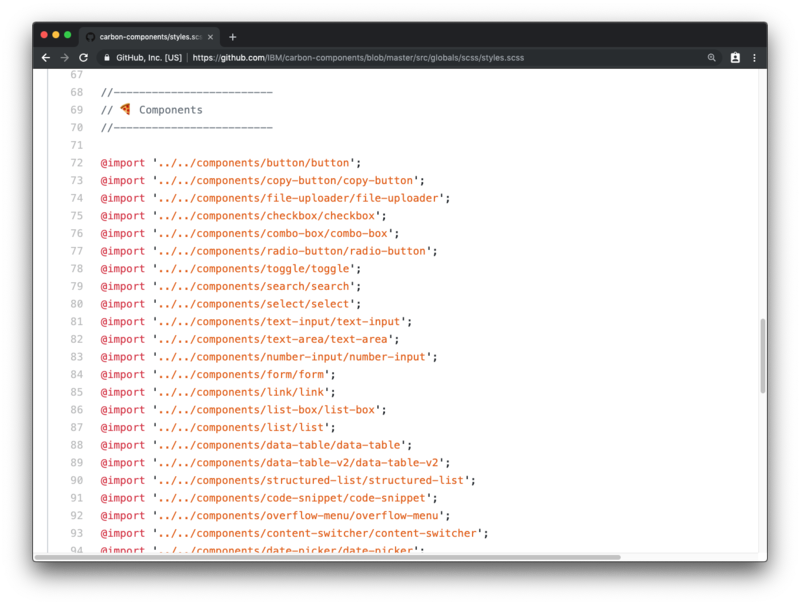 Including this file will give you the same output as the unpkg example, but it also gives you full access to all the variables, helpers, feature flags, and mixins that we offer to make building on top of Carbon even easier. If you’re looking for a good place to start learning more about these tokens, checkout our color guidelines! Ok, now we have the same CSS output as the unpkg link above. So how do we use this Sass approach to optimize our CSS? If you take a look at the source file for our Sass import above, you’ll notice a block that shows how we’re importing all of the components to be included in the CSS output. // And much, much more! Setting your project up in this way allows you to better control your CSS bundle. If we compare this one example where we are only including button, then we see that the output bundle size is goes from 26kB gzipped to 2.4kB! Although this number can be surprising since we’re only using one component, it’s important to remember that behind the scenes we also enabled things like CSS Resets and other tools that help with our final CSS artifact. If you want to go for an even smaller CSS artifact, then messing around with the $css- flags provided above would be a great start! Using Carbon’s Sass files is a great way to improve how you author components. It also opens up the opportunity to fine tune your application to guarantee your users the best experience possible. Run into any issues or have feedback for us? Please make an issue on our project over on GitHub and we’ll make sure to get back to you as soon as possible! 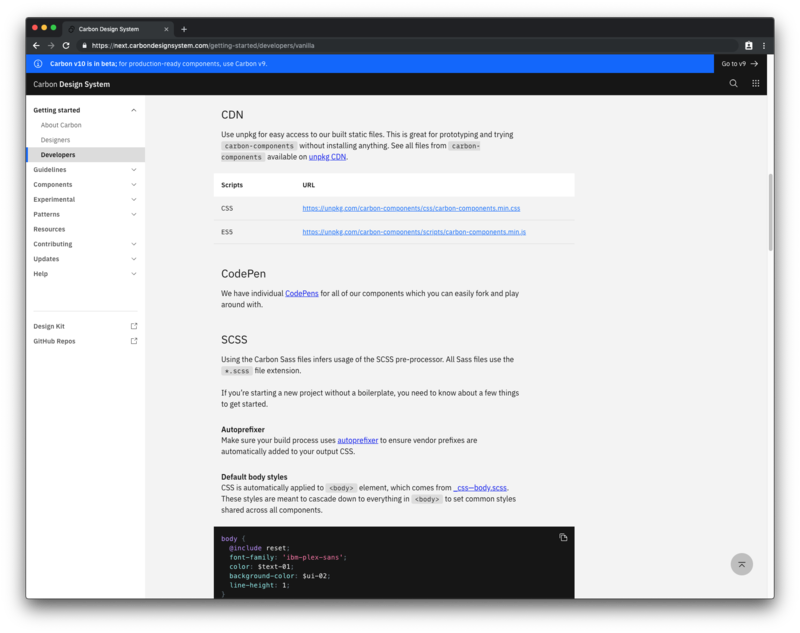 The Carbon Design System is the open-source design system for IBM. It is a series of individual styles, components, and guidelines for creating unified User Interfaces. We’re always looking for contributors for our projects, if you’re interested please check out one of our projects on GitHub. Have any questions or concerns about the Carbon Design System? Please reach out to carbon@us.ibm.com. Thanks to Abbey Hart, Connor Leech, and Vince Picone.